The New Zealand safety regulations for trailer yachts are found in the Yachting NZ, Safety Regulations of Sailing, Part 5. Copies of the regulations are available for purchase from YNZ and PDF copies can be down loaded from the YNZ website. These recommendations are considered to be the minimum standards to be observed by all trailer yacht crews at all times whether racing or cruising. 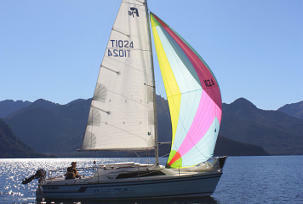 The NZTYA has been made aware of a few trailer yacht capsizes. Generally the capsizes have taken place when the keel has been raised and when crew were forward of the mast. Crew should only be forward of the mast only when it is essential. E.g. for sail changes, anchor operation etc. If a trailer yacht keel is not locked into position and goes to a greater than 90º knock down, the keel may further retract, reducing your trailer yachts righting moment. Recommendation: The NZTYA recommends that wherever practicable that trailer yachts should have their keels lowered and locked in position.